So I have a fairly decent understanding of how my UD2.7 driver works but what I'm struggling with is bridge design. I have a CM200DU-24F on the way as well as a couple of TO-247 full bridge boards that I need to populate but as far as the actually nitty gritty of these go, I'm totally in the dark. Ideally, my coil will be running the CM200 and I'll probably end up using the full bridge boards for other projects but can anyone help me out with schematics, tips, advice and information on how to turn my CM200 into something usable for my coil? I'm in the dark as to where to go once the signal leaves my controller. I'm on 240V mains here so there's no need for any voltage doublers, I just need a basic, strong and reliable power delivery system. 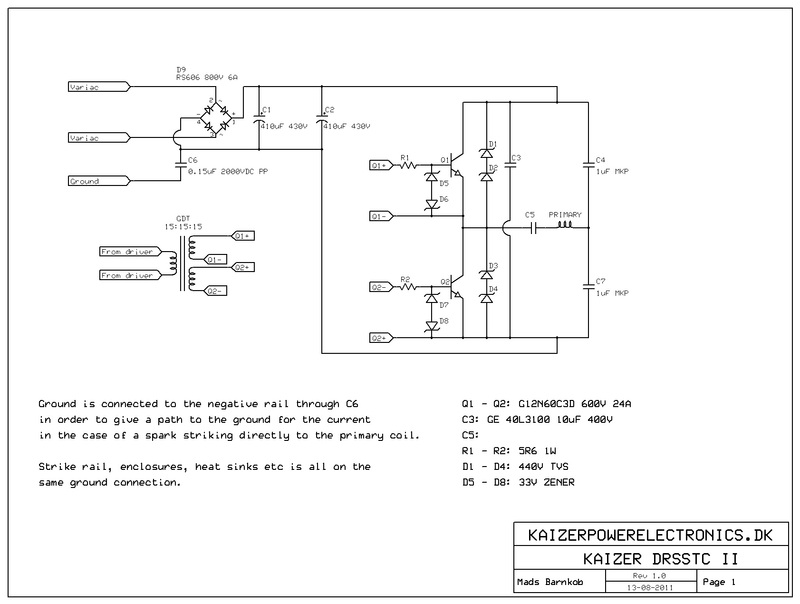 Here are the schematics for my 3 DRSSTC's, just ask if you have any doubts or further questions. EDIT: Ok, a couple of questions. C4 and C7 - What voltage rating am I looking at for these caps? C1 and C2 - I have a pair of 450V, 2400 uF caps, are these overkill? With R1 and R2, am I best off scoping the output of my GDT and see which resistor gives me minimal ringing? C6 - I have a CD 940C 20w1k PP cap (1uF 2000VDC). Is this suitable?